Need to open a letter? Can't Find that Phillips Screw-Driver? Need a Ruler But Don't Even Remember The Last Time You Used One? The Answer to These and Other Such Questions is Here and That Too Credit-Card Sized! 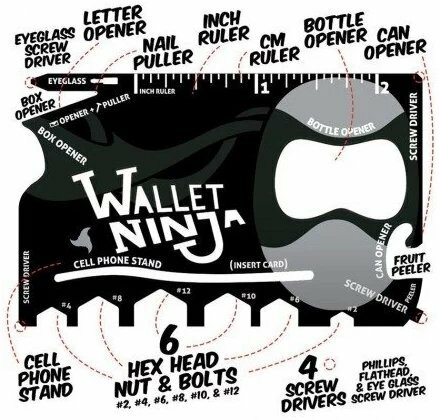 Wallet Ninja - The Power of 18 Reliable and Functional Everyday Tools in the Size of a Credit Card. World's First 100% Flat Multi-Tool.15mm of 4X Heat-Treated Steel in Your Wallet. 6 Hex Head Nuts & Bolts, 4 Screwdrivers, Bottle, Can and Letter Openers, Box Cutter, Inch &cm Ruler, Cell-Phone Stand and even a Peeler. Carry all these utilities in a single Slick and Stylish Tool. Your Buddies will drool when you take it out of your wallet to open a bottle or a can. Just insert a credit card into the slit and it becomes a convenient stand. Rest your Phone on it to watch movies and videos.